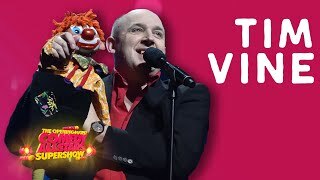 The most obvious bit of time travelling that Tim Vine has achieved with this pilot is to propel it about six hours ahead of where it should be in the schedules. For there’s no denying that with its cheap sets and cheesy jokes this has the feel of a kids’ show, out of place in a 10.35pm slot. The fact it’s based on the legend of Robin Hood doesn’t help, evoking memories of Tony Robinson’s 1990s children’s sitcom Maid Marian and Her Merry Men. But as with Vine’s live gigs, any resistance to the corniness is eroded by his cheery persistence – as long as TV audiences afford him that chance to win them over, and don’t flip channels too early. In the Ronnie Barker Lecture last week, Ben Elton spoke of how snobs often sneered at comedians who appeared to try too hard to get jokes. But Vine is absolutely brazen. In fact, the way he embraces the sheer shamelessness required to mug his way through the pun-heavy script is a huge part of his appeal. The gags come thick and fast, from quite inspired bits of wordplay to the more obvious – ‘someone’s blowing their own trumpet,’ Vine says as a bugle sounds. 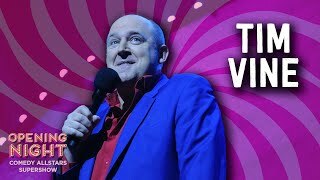 He has a knack of making even new jokes sound old, and to labour them further, he delivers most the punchlines straight down the barrel of the camera. There are many asides to this story, as Vine acknowledges the shoddiness and invites us all to climb on board the silliness. Should you need a plot, it’s that guest star Ore Oduba comes into Vine’s antique shop with a broken golden arrow he wants fixing. Vine then steps into a grandfather clock and emerges, Mr Benn style, into 1205 Sherwood Forest. Though like a broken arrow, the premise is pointless. This was previously a radio show, but Vine has added a few visual gags for the telly – not least making a virtue of the low-rent rendering of a waterfall. And he’s got a great supporting cast, including the always beguiling Sally Phillips as Maid Marian, an underused Spencer Jones (whose own Comedy Playhouse, Mister Winner, gets and airing next week) as Friar Tuck, and Marek Larwood, proving once again that he’s gold standard for playing dimwits, as merry man Glen. 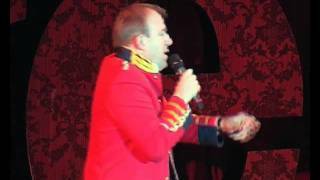 Then there is an almost unrecognisable Tim Key channelling his inner Brian Blessed as he shouts the Sheriff. All the nonsense comes to an arrowhead in the obligatory archery contest – a nod to Vine’s love of darts that recruits legendary commentator Tony Green to call the contest. In what could be an analogy for the script one shot hits the bullseye for every two that go wide of the mark. • Tim Vine Travels In Time is on BBC One at 10.35pm tonight.